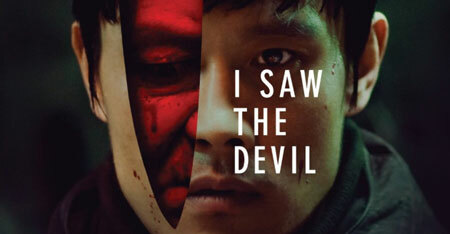 After watching the Korean film ‘I Saw the Devil’ for the very first time, I must say that I enjoyed the unforgettable thrilling experience. The graphically violent thriller follows an enthralling plot where a serial killer murders innocent victims. The film kicks off with an innocent pregnant woman who is gruesomely murdered by the villain Kyung-chul – played by Min-sik Choi. This female protagonist happens to be the fiancé of Kim soo-hyeon, a top secret agent who is played by Byung-hun Lee. I saw the devil centralises on the concept of ‘revenge’ which is apparent between the two main protagonists Kim soo-hyeon and Kyung –chul’s rival relationship. Throughout the entire film, this idea of revenge is definitely portrayed through the compelling rival between Kyung and Lee where they try to rip each other’s corpse out through several frames, consisting of varied weaponry such as; screwdrivers, knifes, weights, hammers, rocks, cutlery, tweezers, cigarettes, guillotines and surprisingly more! The intense hatred between the two characters has been incredibly played out by the two award winning actors. Byung-hun Lee explicitly channels a determined, stoic character which is achieved through his serious and cold facial expressions. This which is compiled with the help of comprehendible close up shots and his simple black, leather costume connoting masculinity. However, during the film we don’t see any changes of facial expressions, idiolect or type of costume, thus making it difficult for us to judge his identity, persona and history. As well as Lee, Kyung-chul successfully creates a horrific monstrous character through his concise dialogue, sinister expressions and his ‘normality’ in killing his prey calmly. Thus, perpetuating the unknown norm that murdering people is ok. I thought that the violent scenes were very well executed especially through the use of low-key lighting and limited daylight exposure, representing a dark surrealistic ambience. This gave me a few chills and at times made me feel uneasy. The iconography of blood and horror are very well executed through several scenes, for example; the chopping of body pieces, knife crime scenes and other revolting stabs. These hard, brutal scenes are believable with the support of the sharp, abrupt sound effects and realistic make up graphics. Due to the constant action, paying attention to detail was difficult; however I did notice that the subtle, non-diagetic music worked perfectly where I found myself glued to the screen. Yet, honestly speaking, the silence in most of the scenes did the trick! Critically speaking, I disagree with the fact that all the victims were predominantly female. Yes, I understand that the filmmakers may have deliberately chosen female victims to express a particular meaning, idea or moral. However, in this case the fact that these victims are heavily stereotyped as passive, vulnerable and naive was undeniably predictable! I thought the film could have done with one or two female countertypes who possibly stood up for themselves or reasonably fought back. This distinctive representation is channelled through the discourse of men in positions of power, which is denoted through the scene where Kyung fiercely asks one of the nurses to “strip” to give him pleasure. This provocative scene somewhat made me cringe, reminding me of my feminist beliefs and therefore disagreeing with the dominant ideology presented. The tagline “Evil lives inside” definitely applies to Kyung’s character. From the very first scene, I immediately grasped Kyung as being the evil, vicious villain and Lee as the heroic protagonist. Having said that as the film eventually developed the difference between the two characters becoming nothing but a blur. Even though we saw Lee defeating the villain, I didn’t see him fully kill him at once. Instead at each violent scene, he became more aggressive than ever, building up his strength and heaving anger which was emphasised in the quote above. To an extent this power that ‘evil’ controls has itself become an iconic signifier which Lee begins to adopt from the revenge craze getting to his head. 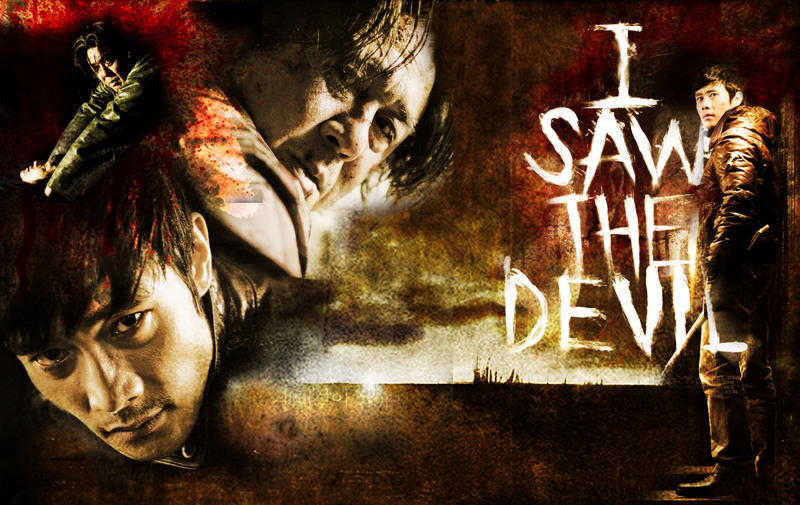 This is clear, as the chief states “You have to become the monster to defeat the monster” (I Saw The Devil, 2010, Jee-woon Kim)Which Lee unconsciously does. Thus, leading to unfortunate deaths of his family members. So, now I begin to wonder, is Lee now as evil as Kyung? Is he no longer the hero of the film? Do both characters share the same evil soul? These questions constantly circulate in my head, and no doubt to other viewers too. As a result this confusion would lead to a puzzling narrative and the audience beginning to doubt the protagonists. Good review. I loved just about every second of this crazy, but unpredictable tale that really seemed to kick itself into high-gear when it needed. The message by the end may not be as satisfying as you would suspect, but it still allows for a great, thrilling watch. Thank you very much. I’m glad you liked it. I agree with you, the ending is not as good, but still a great film. Thanks for commenting! Absolutely loved this movie. It’s exactly what you would expect from Korean film and I really enjoyed the cat and mouse aspect of it. Great review. Thank you for taking your time our to read my review and commenting, means a lot! Im glad you liked it. Nice review 🙂 One of my all time favourite films!